We talk with the team involved with the new spectacle of life, death, and rebirth, Samsara. 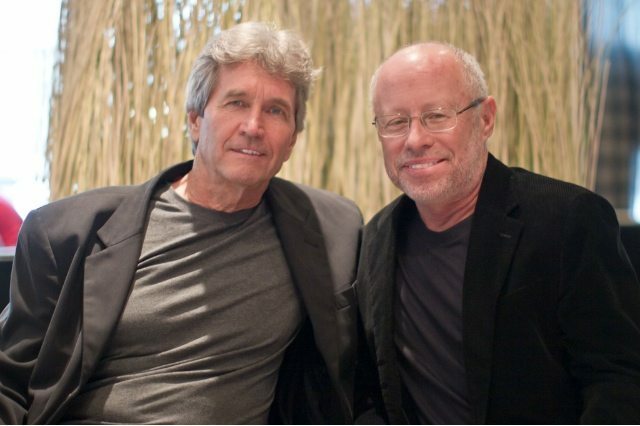 Filmmaker Ron Fricke (left) and producer Mark Magidson. Photo by Christopher Drost/Torontoist. In Hinduism, Buddhism, and a handful of other Indian religions, “samsara” refers the eternal cycle of birth, suffering, death, and rebirth through Karma. So it’s fitting that Ron Fricke’s Samsara is a critical look at life on the planet, exploring ancient and modern societies, the rise and fall of great cities and reclamation amidst sheer destruction. Fricke (Baraka, Chronos, Koyaanisqatsi) and his crew trekked across twenty-six countries during the film’s nearly five-year production, allowing Fricke (who serves as director and cinematographer) and producer Mark Magidson to take us to places both familiar and unimaginable. From sweeping landscapes to time-lapse sequences of the night sky and from exclusive looks into the processing of food (which might very well convert you to a vegetarianism) to the consumption and effects it has on the human body, Samsara is nothing short of astounding. Modern technology, production lines, and human robotics are juxtaposed against a backdrop of deserts, garbage mounds as far as the eye can see, and traffic congestion in modern centres. There is no dialogue. But a visual narrative gives life to the beauty within, carefully strung together with a massive 7.1 surround sound design and music score from Michael Stearns, Marcello de Francisci, and Lisa Gerrard (of Dead Can Dance). We sat down with Fricke, Magidson, and Gerrard to discuss the vision and execution of beautiful and almost impossibly ambitious film. Torontoist: Samsara is such a remarkable followup in many regards to where Baraka left off. Would you say this film is furthering your original intent of where you were going with Baraka? Mark Magidson: In some regards, yes. We are continuing where we left off but this film was original in idea and scope—a lot more ambitious and more difficult in logistics and co-ordination. We employed similar techniques to how we produced Baraka, but with the knowledge we’ve taken in past we were able to apply it to Samsara better than we ever have in past. The time-lapse sequences are perhaps some of the best I’ve ever seen. How much planning did that require? MM: That’s partly why it took us four-and-a-half years to complete. Beyond government and regulatory clearances, we also had to wait for certain seasons or lunar phases to get the light to hit the way we wanted. How difficult was it to get clearance? Ron Fricke: That’s why we shot in the East for the most part. Here in the West, we got a lot of nos when asked. But Costco in California was rather helpful, and we operated completely out of their way which made it work really well. Dubai was interesting to work in as well. Some sequences almost look digitally recreated, such as the shots of Burmese castles. One particular aerial sequence you shot almost looks like it came from Peter Jackson’s laboratory of CG architecture, complete with flocks of birds flying past to make it look real. Yet it’s real. Were the locals in the different countries difficult to work with? RF: We got some of the best portraits from those people in the bush. They seemed very open to it; much more to the art of it than working in the city. They don’t know what this gear is, what these cameras are. They’ve never seen a 65mm Panavision camera: it rather scares them a little bit when we turn it on because it can be really noisy, but they can be rather accommodating and they give you the greatest poses and stares. That’s how we got some of these great portraits. Was it challenging, bringing that kind of equipment into the bush? MM: Well, you pray you don’t have any problems to begin with. That’s the key. Usually it’s alright. The Panavision system is pretty reliable but we did have a backup camera so we had two of those. I don’t think we got burned anywhere. RF: These cameras are like tanks. They can go through just about any condition and keep on rolling. That sort of speaks towards the emergence of new digital technologies: the so-called 4k cameras like Red, Arri, and now the prosumer-marketed cameras emerging. Do you embrace the 4k digital format or do you see yourself continuing with large format and Panavision film-based systems on future projects? RF: Mark and I, when we started this project, looked really hard at digital but that was four-and-a-half years ago. There wasn’t a 4k camera up to snuff to go out on the road. Maybe in a year from now there will be something that matches the 65mm quality that we shot with. We shall see. It’s our understanding that this is the first digital 4k screening at TIFF. Or anywhere, for that matter. What were the logistics like? MM: They originally did not have a 4k installed here at TIFF and we wanted to exhibit the film in the best format possible, as intended, at its world premiere. As a result, TIFF and Christie Projection Systems went back and forth with us…They made it happen and we’re very grateful. What were some of the biggest challenges you faced putting the film together? MM: Mecca was tough, but I think about the one that got away. RF: [Laughs] Oh right, yeah. We couldn’t use the restroom. LG: But you’re boys you could’ve pretty much gone into a corner somewhere. RF: This is a monastery, Lisa! It was a really hard shoot. Lisa, can you speak to your experience working on Samsara? LG: I was in Pasadena and Michael [Stearns] would come over with Mark and Ron too. We struggled at first because we come from a really weird world of film score and magically we organically got everything in order… It was really difficult for a while, because we had a certain cynicism as the music can actually tell a tale that cannot be told in visual format—particularly with a film like this. You can’t risk it becoming a narrative. I think we nailed it. Or at least I hope we nailed it. This work is so important because if we’re going to enter the inner conscious of another person, we better be telling the truth. MM: [Laughs] You better be telling the truth, Lisa. We always do. LG: I’m a nightmare. Foot-in-mouth disease they call it in Australia. Ron, You’ve seen so many places in your career. Is there anything left to tap? RF: The planet is such a wonderful place, full of wonderful things. So many places. We’ve barely scratched it, really. There’s so much. There’s the spectacle kind of places… They are everywhere. They are hard to find and capture but they are out there.